Virginia in Georgina has an average list price of $335,000 The average sale price for Virginia is $322,500 with an average sale to list price ratio of 96 percent. The average time a listing spends on the market is 12 days. A total of 1 listings sold. 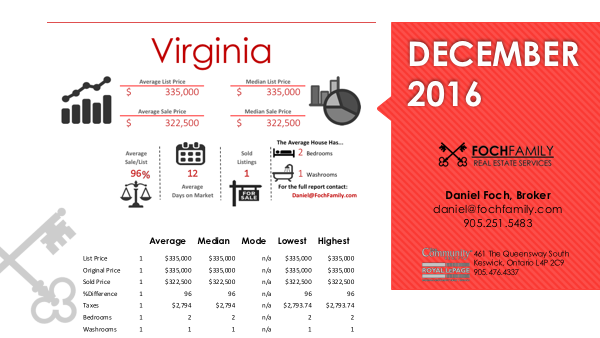 The average house has 2 Bedrooms and 1 Washrooms Virginia real estate information - infographic showing house prices, homes and houses for sale in Virginia , number of homes sold, average days on market, average sale to list ratio, number of bedrooms and bathrooms, house size, and other real estate market information.